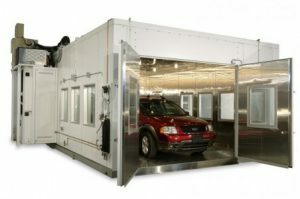 NEW: Fast price quotes for drive-in chambers! Ask us. Environmental testing of automobiles requires additional consideration of the facility where the chamber will be installed, and its planned use. Test methods for vehicles can include additional conditions besides temperature and humidity in an attempt to simulate real-world conditions. 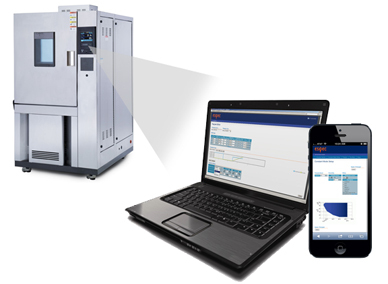 ESPEC builds special floor interfaces to allow use of these additional types of equipment supplied by other vendors. ESPEC builds infrared systems to create radiant surface heating of vehicles to look for deformation and other quality problems. These systems can be adjusted vertically and angled to ensure even coverage. From cold-start to high-heat stress, a running engine is a common need, but complicated requirement fresh air must be conditioned and introduced to the chamber to make up for that used in combustion. Also the exhaust must be safely removed from the chamber.